The Nucleofector Device is an apparatus which delivers unique electrical parameters. The electrical parameters are different from any other commercially available electroporation device and are especially developed to facilitate DNA transport into the cell nucleus. Each electrical setting is displayed as a distinct program which has been adapted to the requirements of a particular cell type. The Avanti J-E high-performance centrifuge is a refrigerated centrifuge that generates centrifugal forces for processing sample preparations, pelleting, extractions, purifications, concentrations, separation of blood cells and gradients, and more. It features a brushless switched-reluctance drive motor, temperature control system, and selectable acceleration and deceleration rates. The FACSAria II Sorter is a digital sorter enabling high speed sorting and multicolor analysis. The instrument accommodates three air-cooled lasers and has a multicolor analysis of up to 15 parameters. It has digital acquisition rates of up to 70,000 events/second. The FACSCanto Flow Cytometer combines a pattented optical design and manufacturer upgrades for simultaneous data acquisition of eight fluorescent signals, two scatter parameters, digital electronics for processing up to 10,000 events per second, and a novel sample injection system supporting carry over of less than 0.1%. The BD Influx fluidics system features a unique acoustical coupling in the nozzle assembly to reliably create droplets for sorting, while ensuring low shear stress to optimize cell viability, even at high pressures. To support aseptic sorting, the fluidics path is easily removed and replaced with the optional disposable fluidics kit. The BD LSRFortessa can be ordered with up to four lasers—blue, red, violet, and UV—which provides a flexibility in laser wavelengths so assay design can be optimized using the latest fluorescent dyes and substrates. The instrument can accommodate the detection of up to 18 colors simultaneously with a defined set of optical filters that meet or exceed the majority of today’s assay requirement. The CellInsight NXT High Content Screening (HCS) Platform is an automated cellular imaging and analysis benchtop platform designed for quantitative imaging. For researchers looking to gain the advantage of automated, quantitative imaging of cells for the first time or for those who are looking to increase scale and capacity, the CellInsight NXT HCS Platform offers a powerful way to automate quantitative cellular imaging. 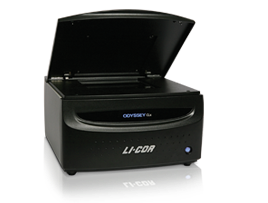 The Odyssey CLx System can be used for many applications, including Western blot analysis, EMSA, protein arrays, In-Cell Assays, On-Cell Westerns, in vivo imaging, Coomassie gel documentation, DNA gel documentation, and tissue section analysis. This model features the world's first twin scan system. This system enables time-resolved spectroscopy of living intercellular contents and also makes it possible to analyze objects down to a 2nm wavelength resolution. The ultracentrifuge is a centrifuge optimized for spinning a rotor at very high speeds. The L-80 XP is capable of generating 602,000 x g at speeds of up to 80,000 rpm. The L-80 XP, along with a broad range of rotors, tubes, and supplies shortens run times for a wide range of applications. The L-80 XP’s special design eliminates the need for chlorofluorocarbons or other ozone-depleting coolants for drive and chamber cooling. The 2104 EnVision Multilabel Reader is our state-of-the-art dual-detector model and among the fastest HTS readers in the market. The instrument includes two detectors enabling simultaneous dual wavelength reading, below emission reading, barcode readers, a high speed light source and adjustment of measurement height function. The UC San Diego hESCCF charges users the price provided by the vendor, plus tax and shipping. The following is a list of our current plastics. The VivaView FL provides an integrated and motorized inverted microscope to allow long-term time-lapse imaging in a constant and optimized environment. Multiple locations in up to 8 samples can be imaged simultaneously with fluorescence or Differential Interference Contrast. Simple, intuitive computer operation removes all the difficulty previously associated with configuring a live cell imaging system. This item is a research microscope that features excellent optics and homogeneous illumination in both transmitted light and fluorescence applications. It is a smart control concept for ergonomic working conditions and multi-user operation – with the option of control via optional TFT technology. The AxioImager allows encoding: read-out magnification, illumination and contrast settings, and transfer to ZEN Imaging software.